zPizza is in a small storefront on the north end near Starbucks and is cramped, with only a half-dozen tables inside and a few more outside. You order at the counter. But zPizza is different and pretty good. Their pizzas are on the healthy side, with organic flour and tomato sauce, gourmet toppings and the options of wheat crust or vegan. They even have gluten-free beer, if that’s how you roll. I go there now and then for their slice, salad and soda special ($7). Recently a friend and I tried it out for dinner. 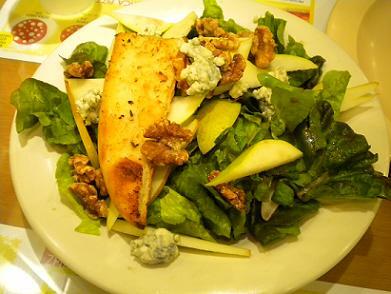 We split a pear and gorgonzola salad ($8.50) and the Tuscan pizza ($17.50 for a large) on whole wheat crust. 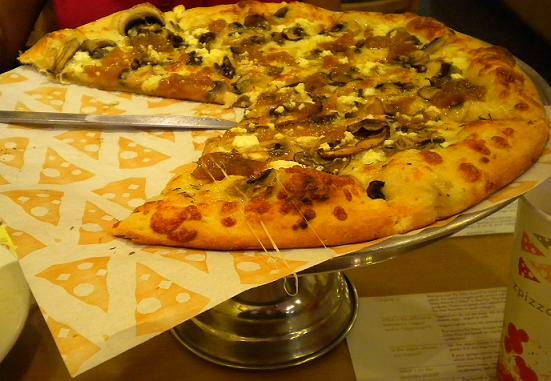 It’s a white pizza, no tomato sauce, with roasted garlic, mozzarella and feta cheese, shiitake and button mushrooms, caramelized onions, truffle oil and thyme. We liked the pizza and the salad both. The only downsides were the shoebox location and the 9 p.m. closing; it’s not a great dinner spot. The service was cheerful. You can view the menu here. The rustica pizzas, on what they call a “free-form crust,” look delicious, as does the curry chicken sandwich. This isn’t the sort of place you’d get a pizza to share with your buddies on football night (although you can get pepperoni), but as essentially a quick-service version of California Pizza Kitchen, it’s pretty good. This is my second-favorite Upland pizza joint, after San Biagio’s. 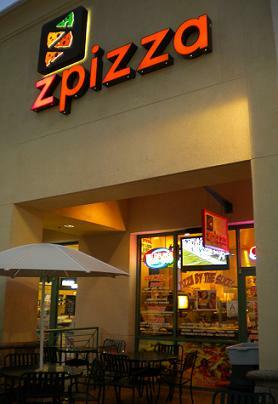 This entry was posted in Restaurants: Upland and tagged pizza, restaurants, Upland by David Allen. Bookmark the permalink. hey david i was wondering if you could find out what happened to the arbys on mountain i drove by yesterday and all the signs Are gone did we loose another restaurant in upland????? One of my friends works at that Arby’s. They have moved to the Arby’s on Foothill in Upland. Gluten-free beer is not really how I roll but I like that the option is there. Shout out to Ms. Leung on her excellent article on Dr. Wing in the DB over the weekend. As a kid I passed that “odd” sign on Holt for years, always wondering about it. It’s great to finally read the rich story behind it. And to find out Dr. Wing was a fellow Claremonter.